We continued our repairs on board, re-provisioned, filled up with gas, and set sails again to cross the Sea of Cortes to reach the Mexican mainland. Puerto Vallarta (N20.35, W105.14) was almost 300 miles away. Mike dug out the auto-pilot which, connected to the wheel, can steer a specific magnetic course. We named him 'Morgan' in absence of our friend and enjoyed less stressy shifts since adjusting sails and watching out for other ships were the only activities left to do. 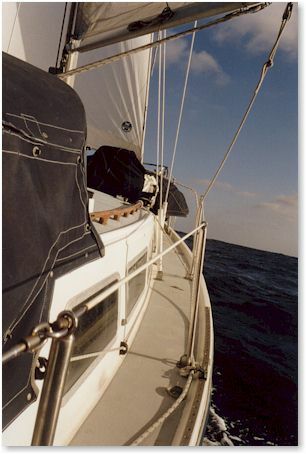 Sailing south along the coast, we noticed several patterns: The further south we got the more did the winds fade away requiring us more and more to use our engine. At the end, we motored probably 40% of the total trip to Panama. Also, facilities were less and less developed. 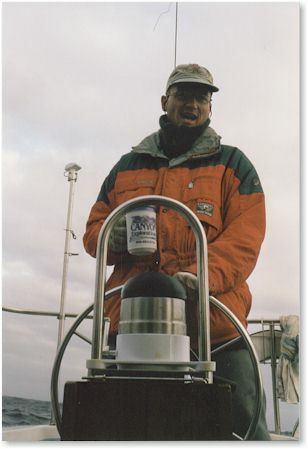 Anchoring in remote bays and searching for gas and food became the most common tasks. This got even more complicated by the day, as English was spoken less and less, inspiring Mike and I to activate some Spanish. Si, Senor! Finally, the climate was becoming more tropical every day. Sleeping bags were replaced by sheets, and long pants and shirts disappeared in 'Not-to-be-opened bags' for the rest of the journey. Starting in Puerto Vallarta (where we went back to the German restaurant I knew from the year before - Erdinger Wheatbeer: YES!) we took a slower pace and stopped in a bay every day or two. On our agenda were Punta Ipala (N20.13, W105.34), Bahia de Camela (N19.35, W105.07), and Bahia Tenacatita (N19.16, W104.50). Here, we went on a jungle cruise: After anchoring in the bay, we took the dingy up a brackish stream which soon narrowed so far that the trees on both sides interlaced on top of us. We were drifting through a green cave. The area was full of tropical birds, and millions of crabs of all shapes and colors were living on the roots of the trees right near the water line. After motoring upstream for several miles, we stopped the engine and paddled for a while. It did feel like being in the middle of a jungle. Where were the alligators? We declared the trip the 'Training Highlight' of the week, referring to Mike's old marine days. The same day, Mike proved his dingy landing capabilities to a fascinated group of tourists. After returning from the stream, we decided on a cold beer at the close by hotel, a quick dingy ride away. Closing in on the shore, we noticed the bigger than expected surf. "Just a question of the right timing". According to Mike, we would be able to land in between two of the waves. That was the theory! It turned out though that neither the timing was right nor the engine power sufficient to push us ashore in-between two waves. 25 meters (75 feet) from the dry beach, a big wave caught the dingy and made it act like a wild horse. It threw me overboard and I was soaked up to my shoulders. Mike stayed dry (for now), while we finally walked the dingy to shore. The rest of our trip South remained mostly uneventful. 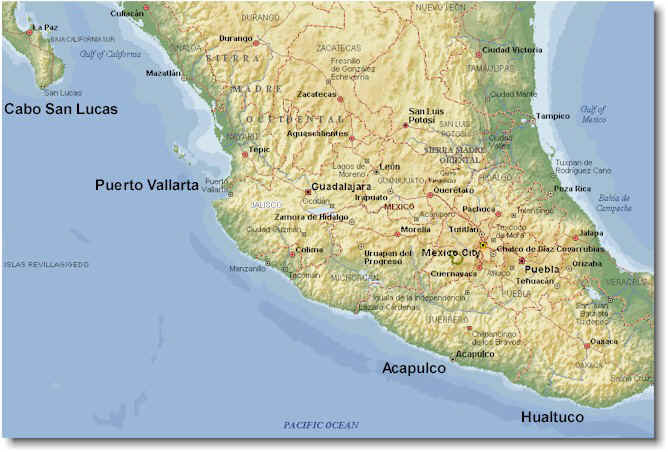 Major stops were in Acapulco and Hualtulco, where we waited out the weather to cross the famous 'Golf of Theuantepec'. This golf is well-known for its high winds, which come out of the Golf of Mexico from the Atlantic side and are being funneled through a small mountain gap before they reach the west coast and create stormy conditions. Together with us, Steve and David with their ship 'Solitaire' were also waiting for a weather window. They had sailed down from San Francisco and were heading for Cuba. Since we already knew them from our stay in Acapulco, we enjoyed our three days of waiting together snorkeling, watching cruise ships putting their passengers on land for a couple of hours, and going to town for some Margaritas.